If we do not have the exact item that you need, we may be able to order it for you. If it is not an item that we normally stock, we will require an advance deposit. Otherwise, you will not be charged for any item until it is being shipped to you or your designated recipient. We know how hard it can be to figure out sizing not only for your own clothing, but also for the wide variety of clothing and equipment for your horse. That is why our staff is available to help you, by telephone or email, with sizing information. We have customers all over the world -- consequently, we have devised creative ways for measuring all kinds of things "from a distance". We understand how hard it can be to find the right saddle for you and your horse. Accordingly, we do allow a trial period and provide written guidelines for you to follow to help you care for the saddles while they are in your possession. Before we ship a saddle to you, we ask that you contact us. Our Society of Master Saddlers Qualified Saddle Fitter, Judi Berninger, is available to answer any fitting questions that you might have. More information can be found here: New and Used Saddle Trial Policies. Sometimes we can become out of stock of an item on very little notice. If this occurs with something that you have ordered you will be notified via email. If the item is not expected back in stock within 30 days, or if you choose not to wait for the item to come back into stock, the item will be deleted from your order and invoice. If the item is expected back in stock within 30 days and we are not notified otherwise, we will process your order as originally indicated and ship the item to you when we receive it. We collect customer information through our web site and retail stores. We use this information to process orders, enhance your shopping experience, and communicate with you about our products, services, and promotions. Please be assured that we will not sell any customer information to outside parties under any circumstances. 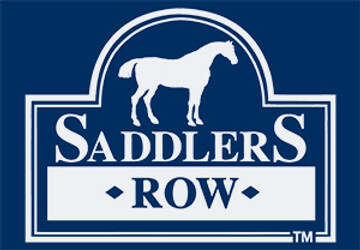 When you place an order at SaddlersRow.com, we collect your name, mailing address, phone number, and credit card information. We also collect your email address so that we can send you any necessary email messages related to your order - such as order confirmation notices and updates on the status of your order. In addition, we maintain a record of your product interests, purchases, and whatever else might enable us to enhance and personalize your shopping experience. We also monitor site use and traffic patterns to improve our website design and the products and services we offer. You can always update your personal information, check order status, and review past orders on our web site. Simply go to the "My Account" link at the top of the main page and log in with your Username and Password. If at any time you would like us to delete any of your personal information on file, please contact us by email at info@saddlersrow.com or by phone at 888/710-7171. Please be sure to include your full name and email address in any email requests. Our Security Policy Protecting your personal information is our number one priority.